Akrotiri; Doomed for Destruction, but When? 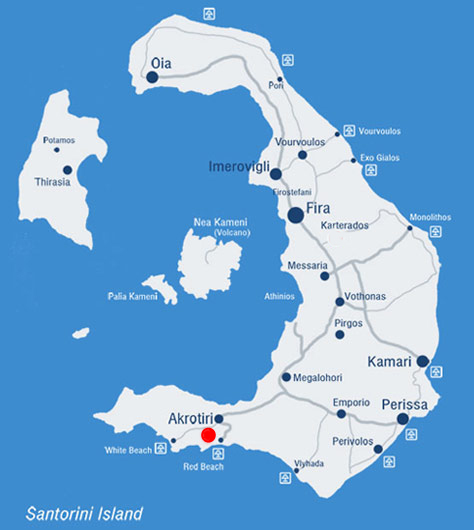 The ancient Minoan city of Akrotiri was an outpost of Crete, and existed on an active caldera. Inevitably the massive volcano erupted causing worldwide effects. China experienced extreme climate change, and pumice was found in places as far away as the Nile and Israel. 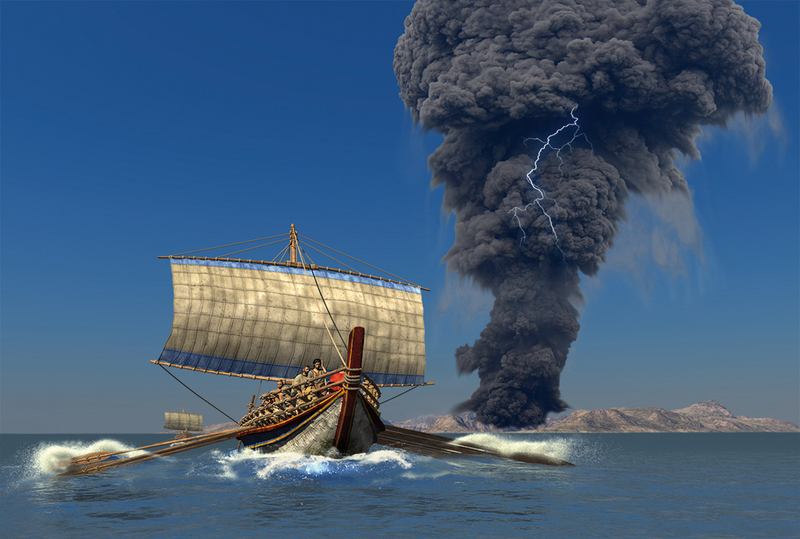 The effects on the volcanic island were incredibly powerful, and completely buried Akrotiri in copious amounts of ash. Today the ash and pumice on Santorini is measured to be 60 meters at its thickest, and led to the island being uninhabited for approximately 200 years following the eruption (1). But when did this extraordinary catastrophe occur? Until 2006, the dates of the Minoan eruption were widely debated and ranged from as early as 1700 BC to 1200 BC (1). The error involved in these attempts at dating the eruption is due to multiple reasons. Dendrochronology (tree-ring dating) was not useful as no properly preserved wood had been found, and most other radiocarbon dating methods only involved single measurements which proved to lead to very inaccurate results. However, in 2002 a discovery was made that changed all of this. A scientist by the name of Tom Pfeiffer discovered an olive tree near the caldera wall that had been buried alive by the pumice of the Minoan eruption and soon after a second tree was found only a few meters away from the first (1). Amazingly both trees were still in their upright position and came complete with olive leaves lying close to their base. 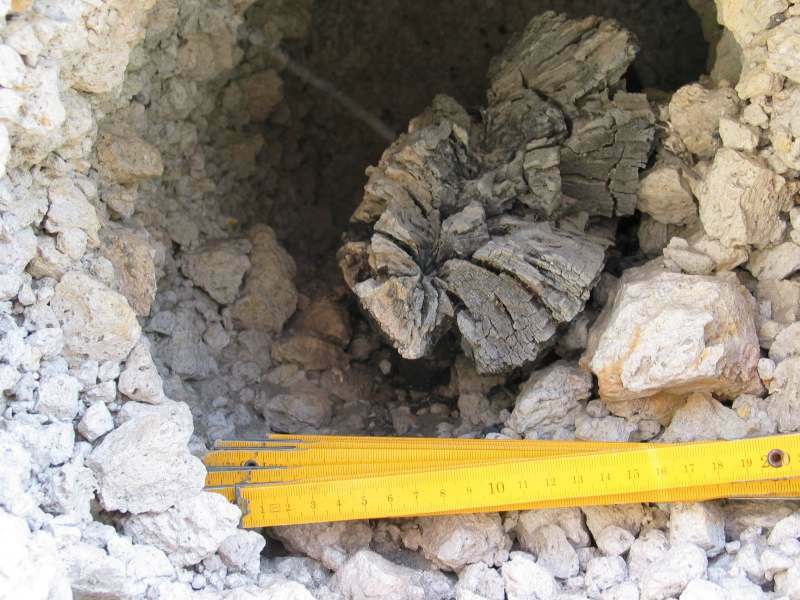 The trees were embedded in a layer of fine pumice dust from the first phase of the eruption and were then completely buried by the third phase. This discovery opened exciting new options for dating the eruption. Olive tree rings are irregular and difficult to count so X-ray tomography had to be used to make each ring clear and visible. After the X-ray, 72 growth rings were found and a method called ‘wiggle matching’ was then used in order to dispel the inaccuracies of single measurement dating (1). Wiggle matching can match a series of dated radiocarbon ages with a previously calculated calibration curve giving much more accurate results. Four rings were chosen to date, the first and last rings and then two in-between. These dating methods were successful and in 2006 a final date was determined for the Minoan eruption that was the most accurate yet; 1613 ± 13 BC (1). This radiocarbon age caused much discussion among scientists, and two questions were raised concerning the accuracy of the new date. Was the tree alive at the time it was buried? And is it possible for previous CO2 to have influenced the results of the dating? The answer to the first question is definitely yes, as leaves were found at its base embedded in the same layers of ash and pumice as the tree. The answer to the second question is most likely no due to a couple reasons. CO2 is known to be locally restricted to the vents of the volcano, and the fact that the tree was about 5 km away from the crater makes it very unlikely that that gas could have affected the results. Also, the tree was on top of a pre-eruption caldera rim which likely had good air circulation making it difficult for the CO2 to make any mark on the tree. With this information, the data given by the radiocarbon dating of the olive tree is considered accurate. The remarkable find of the olive tree led to what is now considered to be the most solid scientific determination of the timing of the Minoan eruption. It is difficult to imagine such an extremely large volcanic event. Dating this event has furthered our knowledge of these caldera eruptions and what explosive and destructive potential they contain. 1) Friedrich W.L., 2009, Santorini: Volcano, Natural History, & Mythology, Denmark: Aarhus University Press, 312 P.
Your title for your post made me realize how temporary life is. What I was wondering about after reading your introductory paragraph was what kind of time frame we are envisioning. For example, I am not sure when Akrotiri was founded, how many people were affected by the volcanic eruption (did everybody flee/get killed), what happened to Greece and surrounding areas, and what did the extreme climate change mean for China (I’d also want to know whether climate change was already in the making, or whether the volcano was the only reason for climate change). It would help if you included the name of the author who you are quoting (According to W. Friedrich,…). Overall, it would help me if I had a better sense of the direction you are taking your blog by providing a more detailed introductory statement on what is still to come in your blog entry. Once you moved into the body of your blog entry, it was easy to see what your points were. I really liked how you discussed the discovery of the olive trees. You provide specific detail which lets me understand the importance of these finds. I am wondering about your own experiences as a geologist in Santorini. How does your work there affect your understanding of Friedrich’s comments in his book? You used an artist’s depiction of Minoans fleeing the site. From your experiences being in Santorini, can you see the truth/fiction in the image? I look forward to reading more of your blog entries. I’d love to see a stronger introduction, and I’d love to see how you interpret the readings you did as a geologist who is actually working at the site. This was super informational, Scott! I had heard so much hype about the notorious olive tree and now I finally understand why. Thanks for the post!